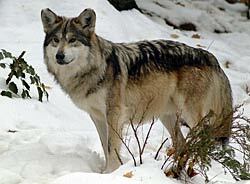 As a participant in the Species Survival Plan for the Mexican Gray Wolf, the National Zoo is home to three Mexican wolves, a male and two females. 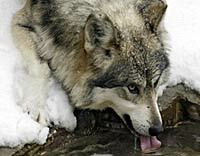 The females were born in May 2005 as a result of the first successful artificial insemination of Mexican wolves (at the Wild Canid Survival and Research Center in Missouri). The Zoo's Mexican wolves live in Beaver Valley, which is home to many North American mammals and birds. The Zoo is also home to maned wolves, reddish-brown wolves that look like long-legged foxes and are native to South America. Friends of the National Zoo will offer a class in the spring (called "Running With the Pack") and a week-long session in the summer of 2008. Students will visit the National Zoo's Mexican wolves and maned wolves, learn from a Zoo representative about issues facing wolves and their canine cousins, and do a wolf-related craft or activity.